ASUS has added another new member to its Transformer family called the Transformer Book T100 in 2013. It's got a 10.1 inch 1366 x 768 IPS display, 31Wh battery, quad-core Bay Trail-T Atom CPU and runs Windows 8.1. With large inner storage option(32GB/64GB) and external connection including micro-USB, micro-HDMI as well as a single USB 3.0 port, the Transformer Book T100 allows users to transfer and store images, videos and documents so that you could carry anywhere you go. With a keyboard well connected, Transformer Book T100 can almost be treated as a laptop except no Disc Driver equipped, and you cannot watch DVD movie collection directly on Transformer Book T100. To play DVD movies on Transformer Book T100, you need to convert DVD collections to Transformer Book T100 compatible format, and then transfer movies to T100 for playback. How to watch DVD movies on Asus Transformer Book T100 region-free? Pavtube DVD to Transformer T100 Converter is a professional yet easy tool to assist with ripping off DVD disk protection and convert DVD movies to un-protected video format with best settings for Transformer Book T100. 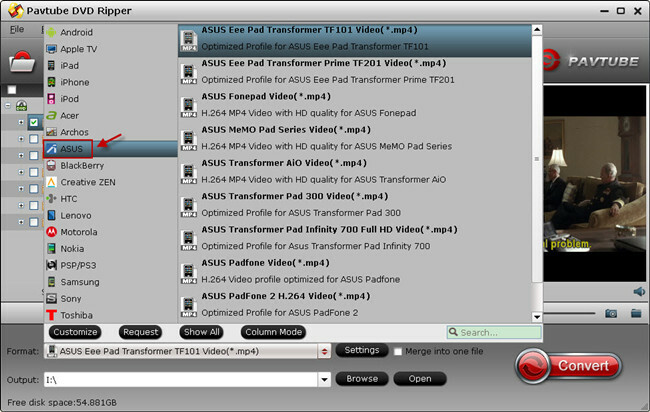 Hit on the “Load Disc” icon, browse to disc driver and import DVD movie. 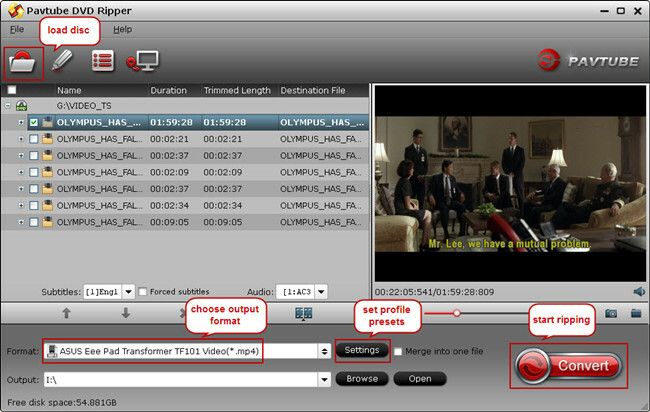 Tip: Choose output movie language and subtitle on the program main interface, and you are allowed to preview movie content in the preview window on the right size of the app. Tap on the “Format” pane, find “ASUS” category and choose the right profile for Asus Transformer Book T100. 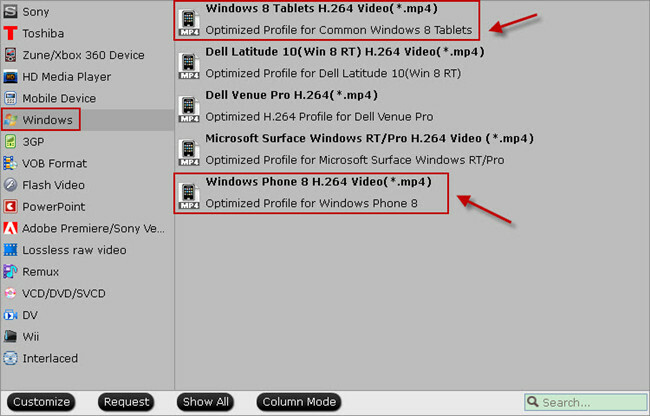 When you have difficulty locating the particular profile for your device, select the general profile for Windows phone and tablet, and then adjust presets with the best settings for your Windows device. Double check the above steps, and click the “Convert” button to start ripping DVD movie to Asus Transformer Book T100 MP4 video. When it is complete, open output folder to find the decrypted DVD movie and move your DVD movies to watch on Asus Transformer Book T100 smoothly.